Powers/Abilities: A trained warrior, Zaladane has commanded vast forces and heavy artillery. She has thrown flaming spears and exploding bombs from the back of a winged steed and commanded vast armies, including the Savage Land Mutates. Using the technology of the High Evolutionary, Zaladane developed the ability to drain the magnetic powers and from the very Earth, using technology developed by the High Evolutionary. She drained Polaris' powers for a time and could manipulate magnetic forces. Zaladane also manipulated some magical forces to aid Garokk in his various transformations. (Astonishing Tales#5 (fb) - BTS) - The followers of Garokk, the Sun God, developed a city in the Savage Land. In the caverns beneath their city, a black pool bubbled, heating the city. The liquid from the pool was fabled to grant immortality, power, and madness to those who drank it. The pool was guarded over the centuries by the Guard-Beast. (Astonishing Tales#3 (fb) - BTS) - A priestess of the sun god and a member of the tribe of his worshippers, calling themselves the Empire of the Sun, Zaladane watched closely the signs and prophecies of her god, claiming a position of power among her people. (Astonishing Tales#3) - Zaladane gathered her warriors, preparing to lead them in a savage battle to claim the Savage Land for Garokk, believing that ancient prophecies would allow him to rise again soon and wanting him to have conquests once he awakened. (Astonishing Tales#3 - BTS) - Zaladane's forces killed and enslaved many. Among the dead were the wife and child of Tongah of the Fall People. (Astonishing Tales#3) - Aboard a flying steed, Zaladane led her forces in razing more lands, planning to attack the Lizard-men tribe next. (Astonishing Tales#4) - Zaladane led her forces against the City of the Vala-kuri, who called her the Sun Queen and feared for their lives. She tossed fiery bombs and spears, seeking to kill all that she saw, including Davair. Zaladane saw Ka-Zar fighting against her men and entreated him to join her. When he refused, she prepared to toss a bomb at him, but it was knocked from her hand by Tongah. A fiery image of Garokk appeared, demanding peace and surrender, and Zaladane's forces did so, infuriating her. Still seeking glory and blaming Ka-Zar for her defeat, Zaladane had her winged steed grab Ka-Zar and flew away. (Astonishing Tales#5) - Zaladane planned to drop Ka-Zar from a vast height, but he jerked her reins from her hands, sending the steed flying wildly. The beast crashed and Zaladane was rescued from a deadly fall by Ka-Zar. Feigning calm and gratitude, Zaladane directed Ka-Zar to the temple of Garokk, where she assumed the mortal guise of Garokk would be. She surmised that Garokk had drank of the black pool and that he would soon go mad. She informed Ka-Zar that the only way to stave off the madness was to bathe in the fiery pool. She then rushed off, leaving Ka-Zar to battle the Guard-Beast. Zaladane then prayed to Garokk and his mortal form appeared in front of her. She sought to appeal to him as her protector, but fled for help from Ka-Zar when Garokk attacked her. Ka-Zar managed to push Garokk into the lava, defeating him. As he departed, the Guard-Beast advanced on Zaladane just before a large statue of Garokk crashed, trapping the Guard-Beast and Zaladane in the caverns. (Uncanny X-Men#115 (fb)) - Zaladane grew furious when the Sheenarians brought their extra-dimensional city into the Savage Land. She led several priests and acolytes in kidnapping Kirk Marston, and used him as a mortal sacrifice to reawaken Garokk, the Petrified Man (who took over Marston's form). Garokk banished the city, then he and Zaladane constructed a city of their own, using slave labor to do so. They planned to take over the Savage Land, fighting against the forces of Karl Lykos, Ka-Zar, Nereel, and Tongah to do so. (Uncanny X-Men#116 (fb) - BTS) - The City of the Sun God was intended by Garokk and Zaladane to be a peaceful place for all tribes of the Savage Land to live in peace, whether it had to be forced on them or not. They utilized the machinery that kept the Savage Land running, however, not realizing they were inadvertently harming the land itself. (Uncanny X-Men#115 - BTS) - Because of the City's construction, the machinery weakened, and it began to snow, turning the Savage Land frozen. (Uncanny X-Men#116) - The flying navy (on pteradons), including Ko-rat, managed to capture Banshee, Colossus, Cyclops, and Ka-Zar when they approached. Garokk and Zaladane were determined to sacrifice them to flames, but the other X-Men arrived to fight them. Garokk, severely depleted, fled to the machines beneath the city and began to absorb more power. Cyclops pursued him and they fought until the ground beneath them collapsed. Garokk was sent spiraling downwards in a chasm to his death though Storm had tried to save him, while Cyclops was saved. The threat over, the Savage Land returned to its normal state. 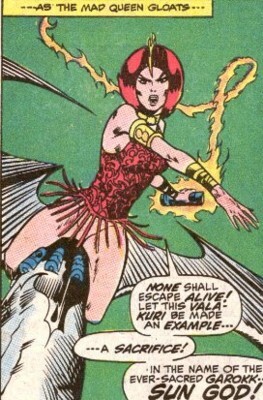 (Marvel Fanfare I#3 (fb) - BTS) - Zaladane took control of her cult, who'd been following the Savage Land Mutates. She allied with the Mutates (Amphibius, Barbarus, Brainchild, Gaza, Timberius, Vertigo) and Sauron in an attempt to take over the Savage Land. Sauron constructed a citadel that sapped the wills of any nearby enemies, and Brainchild constructed a machine that could evolve or devolve anyone. (Marvel Fanfare I#4 (fb) - BTS) - Tanya Anderssen and Shanna the She-Devil were captured, devolved, and imprisoned. (Marvel Fanfare I#3) - Zaladane and Brainchild watched from afar as the Mutates battled the X-Men (Angel (Warren Worthington), Colossus, Nightcrawler, Storm, Wolverine). Amphibius soon led the X-Men near the citadel, where Sauron easily defeated all but Angel, who escaped. The X-Men were strapped into the machine and devolved. (Marvel Fanfare I#4) - Sauron drained the X-Men's energies, returning them to their natural states, and ordered Zaladane and Brainchild to devolve them again while he investigated a potential attack. Despite Zaladane's reservations, Brainchild took Storm off to try and seduce her. While Zaladane focused on devolving Nightcrawler, Storm and Ka-Zar attacked her. Storm, with great effort, summoned a wind that knocked Zaladane out. The X-Men soon defeated Sauron and the Mutates as well. (X-Men Annual I#12 (fb) - BTS) - With Zaladane at their head, the Mutates (Amphibius, Barbarus, Brainchild, Gaza, Lupo) joined forces with the High Evolutionary as he worked to restore the recently devastated Savage Land. (X-Men Annual I#12) - Zaladane was introduced as the High Evolutionary's assistant to Havok. Later, the High Evolutionary used the strangely restored Garokk as a channel to restore the Savage Land. He departed immediately after and the Mutates and Zaladane plotted to seek their own power. (Uncanny X-Men#249) - Zaladane sent a group of warriors to Punta Arenas, Chile, to apprehend Polaris, and the soldiers slaughtered everyone in sight. The X-Men (Colossus, Dazzler, Havok, Psylocke) arrived to defend her and took down the Mutates (Amphibius, Barbarus, Gaza, Whiteout). Surrounded by warriors, Zaladane apprehended Polaris, keeping her in check with a Black Lotus flower, and she promised to leave the city if the X-Men would release the Mutates to her. (Uncanny X-Men#250) - Zaladane raised a large magnetic tower, destroying the Vostok 3 station and killing many operatives there (including Semyon Eduardovitch and Dmitri). She had Lupo (now transformed) and the others gather the survivors to be presented to Worm. Barbarus loaded Polaris into the High Evolutionary's trans-mutator. She ignored Brainchild's warnings of danger and had Gaza and Lupo take down Havok (who'd been hiding among Zaladane's soldiers). Amphibius subdued Havok with a Black Lotus flower, and Zaladane had Lupo restrained since he wanted Havok killed. Zaladane then entered the machine with Polaris, draining all of her powers, and soon seeing the surviving Russian operatives, Vassily Illyich and Lasha, made into her servants by Worm. When the X-Men approached, Zaladane controlled Colossus' body, forcing him to nearly drown Psylocke, while Worm took over Dazzler. Zaladane stood before her new X-Men captives, who were chained along with Ka-Zar, Shanna, Nereel, young Peter, and Ka-Zar's young baby. She offered to demonstrate her powers by having Colossus kill the two children. Chaos struck when a super strong Polaris attacked, though, and young Peter managed to knock out Worm with a gun blast, freeing all of Zaladane's captives. Colossus and Polaris knocked out Barbarus and Brainchild, and the X-Men fled, Havok collapsing much of the tower with a blast as they did so. (Uncanny X-Men#274 (fb) - BTS) - Zaladane began amassing power across the Savage Land. She took over the High Evolutionary's former base, took control of the Savage Land Mutates (Amphibius, Barbarus, Brainchild, Lupo, Worm), and constructed several towers across that Savage Land that would draw in magnetic power, increasing her own abilities. Worm, of the Mutates, began capturing several natives and turning them to Zaladane's will. In time, she had control of much of the Savage Land, her power slowly increasing, and she sought to gain even more. When Nick Fury and a SHIELD transport came to investigate, Zaladane struck them down, then made it so no electronics (beyond those maintained by her or their own generators) could be used. (Uncanny X-Men#274) - One of Zaladane's war parties, led by Barbarus, Amphibius, and Whiteout, attacked Ka-Zar, Zabu, a weakened Magneto, and a powerless Rogue, but they were defeated and left buried in a cave. Zaladane led Brainchild, Gaza, Lupo, and other soldiers on a second attack, and she knocked Magneto from the air. They fled, however, when Nick Fury and the downed SHIELD agents (including Yuri Semyanov) joined the fight. (Uncanny X-Men#275) - Semyanov (whose son Magneto had killed years before) betrayed the others and approached Zaladane. Speaking for the United Nations, he stated that Zaladane would be considered the leader of the Savage Land, which would be instated as a sovereign nation, if she could kill Magneto. Wanting the power, she agreed to the deal. Magneto was soon captured and placed in a siphoning device by Brainchild, and Zaladane began absorbing his magnetic abilities. They were all subject to viewing Magneto's most private memories while this took place. Zaladane decided to keep Magneto alive for one more day so that she could get more of his power. Rogue (her powers restored), Ka-Zar, and Fury stormed the base, and Rogue collapsed the ceiling, leaving Zaladane to avoid being crushed by Semyanov (as she didn't know how to make a magnetic shield). Furious, Zaladane lashed out at Rogue, not noticing that Magneto had started the siphoning equipment again and killed Semyanov. Magneto, in charge of his full power, pushed metal spikes past Zaladane's barrier, killing her, despite the entreaties from Fury and Rogue not to. Zaladane's base and towers were soon destroyed. Comments: Created by Gerry Conway, Barry Smith, and Sam Grainger. Zaladane had an entry in the Official Handbook of the Marvel Universe Update '89#8. any characters not mentioned in this profile.